Pansage in game: 5,211 Who? Important notice! Pokemon Pansage is a fictional character of humans. Pansage (Japanese: ???? 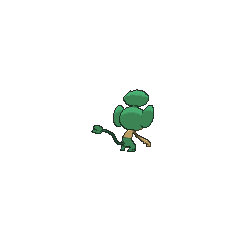 Yanappu) is a Grass-type Pokémon introduced in Generation V.
It evolves into Simisage when exposed to a Leaf Stone. Pansage is one of the three elemental monkeys. The other two are the Fire-type Pansear and Water-typePanpour. 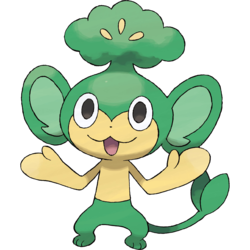 Pansage is a simian, green-and-cream Pokémon. It has oval, black eyes, large ears with light green insides, and a tiny, black nose. There is a broccoli-like sprout atop its head. In the sprout's foliage are three yellow, tapered seed-like shapes. If eaten, the leaves in this sprout can alleviate exhaustion. Its muzzle, upper body, and skinny forelimbs are cream-colored, and its hands seem to have no fingers, aside from a thumb. Pansage's lower body is green with small feet, and its long tail is tipped with two leaves. Pansage dwells deep in the forest, where it collects berries to share with its friends. 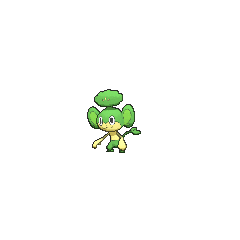 Cilan owns a Pansage that first appeared in Triple Leaders, Team Threats! along with Pansear and Panpour owned by Chili and Cress respectively. A Trainer's Pansage was seen at a Poké Mart in A Connoisseur's Revenge!. A Pansage made a brief appearance in Lost at the Stamp Rally!. Multiple Pansage appeared in A Maractus Musical!. A Pansage appeared as a plush toy in A Jolting Switcheroo!. A Trainer's Pansage appeared in Under the Pledging Tree!. A Trainer's Pansage appeared in An Oasis of Hope!. A Trainer's Pansage appeared in A Giga Battle with Mega Results!. A Performer's Pansage appeared in A Dancing Debut!, where it was used during the Couriway Showcase. It appeared again in Master Class Choices!, where it was seen competing in the Fleurrh Showcase and then again in Master Class is in Session! where it participated in the Gloire Showcase. 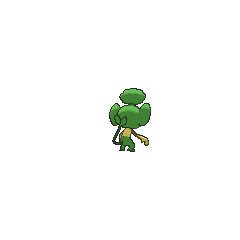 A Pansage appeared in Party Dancecapades!, under the ownership of Lily. BW005 Pansage Ash's Pokédex Pansage, the Grass Monkey Pokémon. 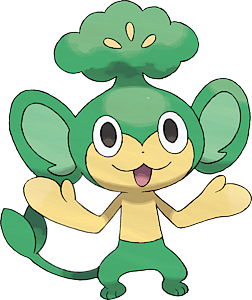 Pansage offers leaves on its head to Pokémon that have low energy. The leaves relieve stress. In the Pocket Monsters BW manga, Cilan uses a Pansage against Red's Clefairy in PMBW02 when he tries to instigate a fight between Cilan and his brothers Chili and Cress. The three brothers use their Pokémon against Clefairy, however, their group attack backfires when Clefairy uses the effects of Pansear, Panpour and Pansage to make green tea. In The Key to Triple Battles, Cheren uses a Pansage against Monta in a triple battle. 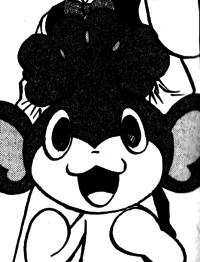 Pansage made its debut in Pokémon Adventures as a short cameo in A Nickname for Tepig, alongside Cilan. It later appeared in Welcome To Striaton City!! where it prepared tea for Black, Cheren, and Bianca alongside its fellow elemental monkeys. In Their First Gym Battle it battled against Bianca's Oshawott and won, but later unintentionally caused it and Snivy to be revitalized after they ate the leaves from its head. Pokémon Adventures Their First Gym Battle This Pokémon dwells deep in the forest. Eating a leaf from its head whisks weariness away as if by magic. Moves marked with a superscript game abbreviation can only be bred onto Pansage in that game. 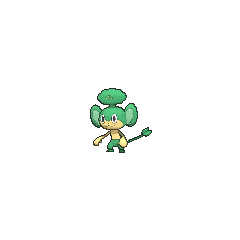 For other sprites and images, please see Pansage images on the Bulbagarden Archives. Pansage was first seen, together with Axew, as a toy featured in two images seen July 2010, but it wasn't named and nothing was known about it. In the beginning of August 2010, a fake leak of the September issue of CoroCoro showed its own version of this Pokémon. Pansage was officially revealed August 22, 2010 by Pokémon Sunday. Pansage is based on a monkey and a tree; the fact that it is based on both may mean it might be based on the legends of monkey trees or possibly a visual pun on leaf monkeys. It, along with its two contemporaries, seems to be inspired by the three wise monkeys motif; with its mouth open, Pansage represents "speak no evil". Pansage may be a combination of Pan (the genus of Chimpanzees) and sage. Sage may either mean a type of plant or a wise person, the latter possibly relating to the "three wise monkeys" motif of the elemental monkeys. It may also come from the German sagen, meaning to say. Yanappu may be a combination of ? yanagi (willow) or ?? yasai (vegetable; an alternate reading of ? is na) and ape. Mandarin Chinese ??? Huayéhóu From ???? qing huayécài or ??? huayécài and ? hóu.